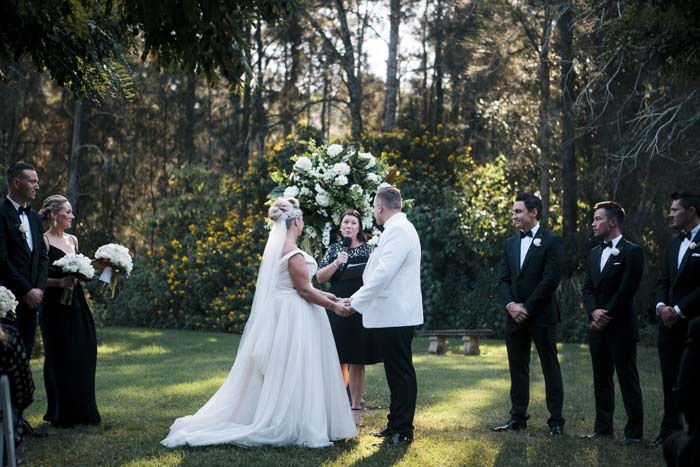 This captivating wedding celebrates the best that the Hunter Valley has to offer: fine dining, wine tours and sophisticated country elegance. We met on the first of November 2011 - it was Melbourne Cup Day at The Ivy in Sydney. We both had been 'lunching' and celebrating ‘the race that stops the nation’. Joe noticed my bright orange fascinator and came over and offered to buy me a drink. He always jokes that he ‘backed a winner that day’. When he forgot what apartment number I lived in so knocked on every apartment in my complex to find me. You can only imagine, the neighbours were not as thrilled as me! I always loved the striking combination of black and white so our wedding was themed around those colours. We tried to get creative and had a fantastic wedding logo created out of our initials which was used throughout our entire wedding (subtly of course). We also had a step and repeat (media wall) created so our guests could have photos on the red carpet like they do at the Oscars. We supplied props like an Instagram frame and created a hashtag for guests to upload photos. For me, attention to detail is everything and I tried to ensure that no little detail was forgotten. We had an ‘After Five’ dress theme and our guests looked classic and sophisticated. We wanted our guests to have a great weekend away, so we planned different events with the wedding being the main event. There was a cocktail mixer the evening before the wedding, a choice of a round of golf or a half day wine tour the morning of the wedding and an easter egg hunt the day after the wedding. 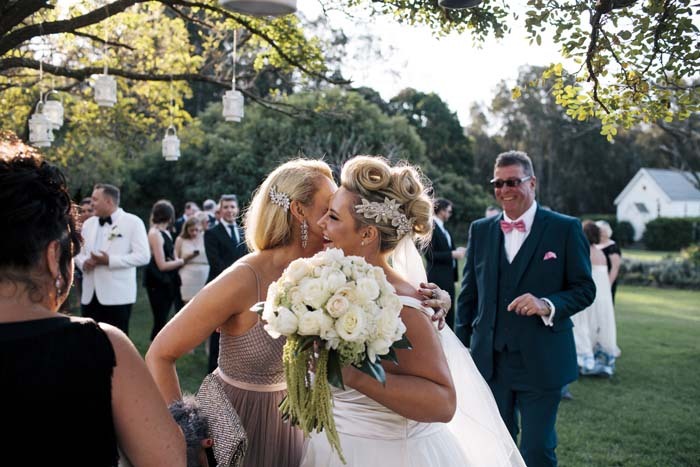 Our ceremony was held in the grounds of Peppers Convent in the Hunter Valley. We wanted to get married outside in the beautiful grounds. We wrote our own vows and had live music playing throughout. I walked down the aisle to Let’s Stay Together by Al Green and high-fived everyone as I walked down the aisle, so excited to see all my friends and family (and of course my groom)! Our reception was held at Circa 1876 restaurant. It's a part of Peppers Covent, Pokolbin in the Hunter Valley. We chose Circa 1876 for the stunning surrounds, exceptional food and service which was second to none. They made the whole process or organising a wedding super easy and fun. Joe and I are both ‘foodies’ –so Circa 1876 was an obvious choice. We were so thrilled when executive chef Trent Barrett agreed to introduce the ‘food philsophy’ of Circa 1876 and walk our guests through the menu. This was an important part of our evening which our guests adored. We chose Photography by Marko off a recommendation from a friend whose wedding photos I loved. I wanted to support a local photographer of the Hunter Valley. We had two bridal parties one called the ‘I Do Crew’ and the other was called the ‘Four Wise Men’. The I Do Crew wasn't traditional as it included my best male friend and two of my best girlfriends. My bridesMAN was Daniel and my school friends of 25 years, Renee and Eliza were my bridesmaids. The Four Wise Men were our friends Ryan, Will, Bill and Jack. I wanted them to have their own individual style, so Eliza wore a long black dress by Zimmerman whilst Renee chose a short, lace gown by Alex Perry – they both looked stunning! 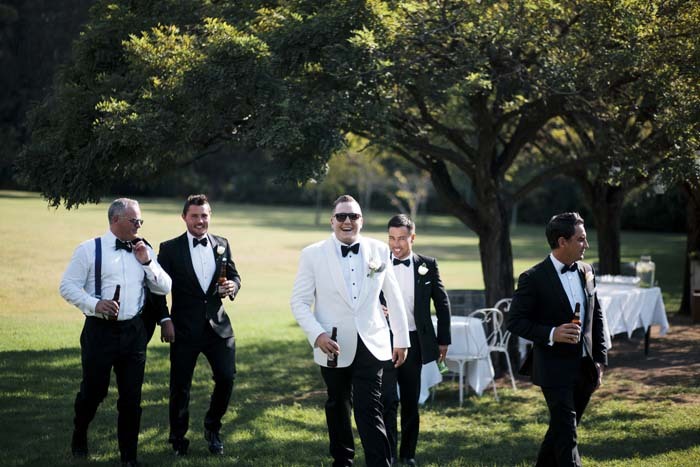 The groom wore Tom Ford and the groomsmen wore their own tuxedos or hired through Peppers formal wear Cremorne. My wedding gown was Pronovias (Tresia) from Marry me Bridal in Mosman. A classic, sophisticated dress in satin and tulle. It had a draped bodice with straps, v-neck front and back and a full tulle skirt. We had a black and white theme with flowers galore! 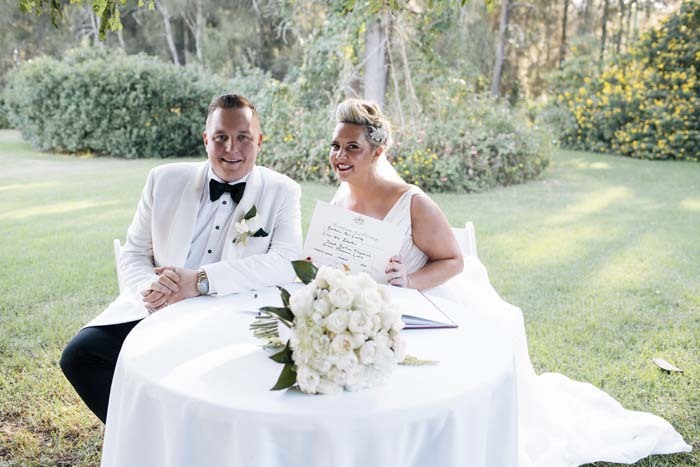 The tables were covered with white linen with black napkins and a personalised thank you card from Joe and I on each setting. We used old wine corks (with a slit in them) and had the place card inserted into it (seemed appropriate getting married at a vineyard). Each guest received a gold Lindt bunny at their seat (as it was Easter weekend). The table was full of candles and stunning flowers. We also had a feature ‘floral’ wall behind the bridal table which was magnificent. It was the Easter long weekend, so we gave each guest a golden Lindt bunny. You have never seen the look on the face of the shop assistant when I asked to buy 150 of them. We started the day with a hot air balloon flight over the Hunter Valley. It was spectacular to see the sun rise on your wedding day with your bridal party beside you. So much fun. Work hard, have fun and enjoy life as Mr and Mrs Fitzpatrick. Use suppliers you are 100% comfortable with and that understand your vision for the day. I absolutely loved the people I dealt with and they’re really the ones that bring your wedding day dream to life. From my wedding co coordinator at Circa 1876 to my stylist/florist, photographer and band. You will speak to them more (in the lead up to your wedding) then your groom.